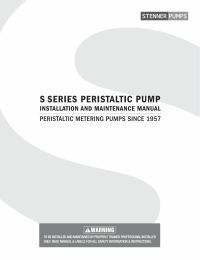 The S Series Variable Speed Pump is an advanced peristaltic metering pump designed to interface with process control systems. The S3002 prevents unauthorized access to programmed settings because of password protection. 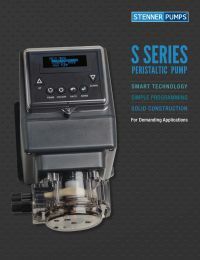 This programmable pump features a transfer function that will activate a relay to start a back-up S Series pump. 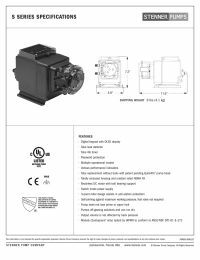 The S Series pumps can be programmed to respond based on a selected pump condition such as tube leak, tube change, standby, repeat pulse, run, mode change, low or high signal, low or high flow, drive fault, signal overrun, transfer and off. The totally enclosed pump is outdoor rated and built to NEMA 4X for demanding applications. Additional agency listings include NSF 61 & 372, cULus indoor/outdoor; CE IP65 is also available with selected voltages. The brushless DC motor is equipped with ball bearing support and the switch power mode offers energy efficiency. The splined shaft designed pump head and roller assembly allow smooth installation and replacement. Tube replacement is fast and easy with the patent pending QuickPro® pump head.